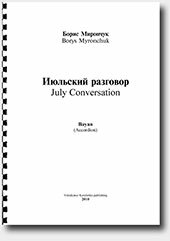 You can buy Waltz "July Conversation" by Borys Myronchuk in compilation "Waltzes"
Video demo: Borys Myronchuk. July Conversation (Jazz Waltz). Video demo: Borys Myronchuk. July Conversation (Jazz Waltz), bayan (accordion).